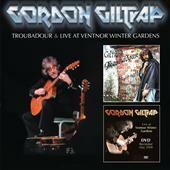 Edsel is proud to announce its programme of re-issues from Gordon Giltrap, one of the UK's premier guitarists. Originally released in 1998, 'Troubadour' is Gordon's own favourite album, out of the thirty plus he has recorded since 1968. It showcases some of Gordon's favourite compositions, sympathetically enhanced by beautiful arrangements of Del Newman (Elton John, Cat Stevens, Chris De Burgh, Squeeze, Paul Simon, Art Garfunkel and many more). The album also contains three songs that Gordon played in Tim Rice/John Farrar musical Heathcliff ', the first of which features Cliff Richard on vocals. The bonus DVD is the first release of Gordon's concert at the Ventnor Winter Gardens in May 2008, which features many of Gordon's best-known pieces alongside his rendition of George Harrison's 'Here Comes The Sun' and 'God Save The Queen' performed a la Brian May. Aside from Gordon's illuminating and amusing between-song anecdotes, the 130 minute-long DVD features a lengthy bonus interview conducted in January 2009. The booklet contains track-by-track annotation by Gordon himself, as well as photos and ephemera from his own archives.